Moses Hesskew a true Pioneer of the early West. Born in South Carolina, he most likely moved to Georgia and then to Alabama with his family before coming to Texas. Moses made his way across the South from humble beginnings to settle in Texas during the Days of the Republic of Texas. Moses joined many other men and families that came to Texas to find their fortune. Moses seems to have joined his younger brother William already in Texas in or about 1837. During 1839, Moses fought Indians alongside Capt. Jack Hays in what may have been an early Texas Ranger company. Moses and William both participated in defending the young Republic of Texas from Mexican incursions that occurred in 1842. (Moses' Certificate of Vasquez / Walls Campaign) He was a Texas Ranger, Sheriff, a farmer , a rancher, and a teacher it is said. He fought Indians and probably had a run in with a cowboy or two in his day. Moses rode with the famous Texas Rangers under the command of Captain Jack Hays and fought off the Mexican army invasions of 1842 in what has now become known as the Vasquez and Walls Campaigns. 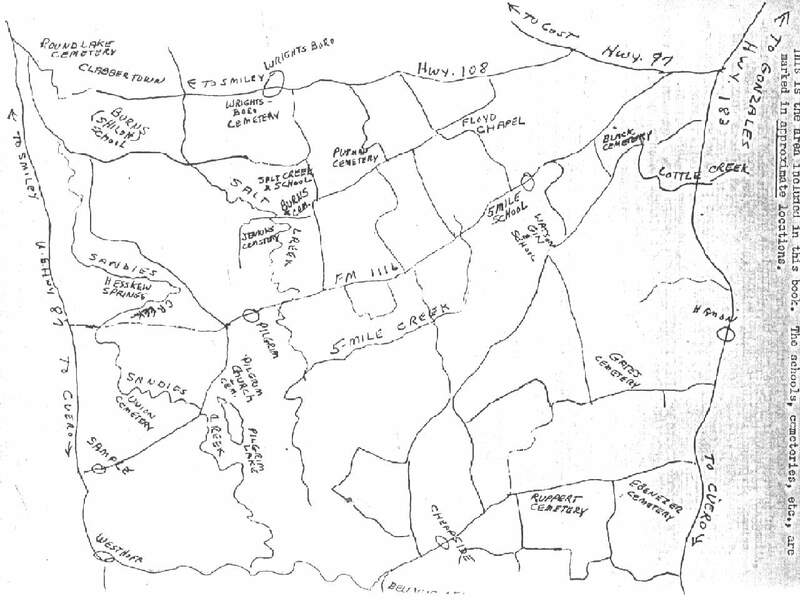 ( The Walls Campaign included the The Battle of Salado and Dawson Massacre . Moses and his brother William both have become legends, heroes of family lore. See Muster Roll of 1839 here. "San Antonio depended on its "Minute Men" to chase the Comanches whose reprisals were many and constant for their losses in the Council House. The Minute Men had been organized in San Antonio by Jack Hays to combat the constant Comanche raids. Volunteers to pursue the Indians were notified by a flag that waved on the Plaza In front of the court house and by the ringing of the Cathedral bell. They continued to hold their horses ready, just as they had done in 1838 and in 1839. In the stable we built on our house lot, Mr. Maverick kept a fine-blooded horse, fastened by a heavy padlocked chain to a mesquite-picket. The door of the stable was securely locked also, for every precaution was necessary to prevent his being stolen. This was the "war horse." Mr. Maverick was a member of the Volunteer Company of "Minute Men" commanded by the celebrated Jack Hays ... Each volunteer kept a good horse, saddle, bridle and arms, and a supply of coffee, salt, sugar and other provisions ready at any time to start on fifteen minutes warning, in pursuit of marauding Indians. At a certain signal given by the Cathedral bell, the men were off, in buckskin clothes and blankets responding promptly to the call." "Within a year after the Land Office had opened, there were a hundred and forty young Anglo-Americans in San Antonio, and during that time not less than a hundred of them "were killed in various fights with the Indians and Mexicans."' Many of these "remarkable young men" 2 having arrived too late to participate in the decisive battle of San Jacinto were attracted to Bexar by its novelty, climate, land speculation, and adventure." " Hays usually selected ten men to accompany him on survey expeditions. Between trips he frequently was occupied with the punishment of guerrillas from Mexico, who sought to prey upon pack-mule trains or outpost towns. For paying his men at this time, Hays depended upon surveying fees and bonuses from those who wished their lands located, despite the danger involved. With so little money from the government available, Hays' surveying was often his only maintenance. When not in the field, Hays's residence was San Antonio where the cost of living was low, recreation was simple, and surveying or fighting bandits and Indians provided plenty of exciting action. One of thirty thousand white inhabitants of Texas in 1836, he had witnessed the increase of settlers to almost forty-five thousand by the beginning of 1839. San Antonio was the western gate to the frontier that extended to the Rio Grande. Often Hayss little companies of Rangers, militia, or surveyors helpers numbered only ten or a dozen. He was the leader of a close-knit band in a region where guerrilla warfare raged among three races. Hays was once miles away on a surveying tour when a Comanche herald had appeared in that part of San Antonio later known as Commerce Street. On a prancing steed, he challenged the townsmen to come out to fight his band. Eleven inexperienced men followed him. Only three escaped the trap set by a hundred Comanches. " These were the conditions and historical events that Moses and William Hesskew were living in. Moses was surely part of the Militia and may have been a Ranger as well. The Hesskew brother were said to have been surveyors and may well have surveyed with Jack Hays or headed up their own surveying operations. Wm. had a thousand dollars he used to purchase a ferry in Gonzales in 1846. It may well be that the risky business of surveying on the frontier paid the Hesskew brothers well. Based on the facts above, they must have been excellent frontiersmen to have avoided the fate that befell so many other young men who made San Antonio their home during this time period of Texas history.. Evidence supports that Moses was a member of a militia group in December of 1839 and Wm. and Moses were both citizens of San Antonio in 1840 based on voting and tax records as well as 1840 Census records. What Moses and William did for a living during that time is unclear. Some speculation would be that they were Texas Rangers or Wagon Masters. Family members have passed down these stories, but to date we can not be sure exactly what they were doing. Evidence leads us to believe that William was working on the "old stone ranch" near the Medina River in 1842. They might have been farming, ranching, surveying, operating ferries, or serving with the Texas Rangers. Moses, was awarded a second-class Headright Land grant of 640 acres. This award indicates that Moses was a single man who arrived in Texas as an immigrant after the Declaration of Independence and prior to October 1, 1837. Evidence indicates the property was in Bexar County. With the spin off of Atascosa County, Texas County from Bexar at a later date, it is my belief that Moses property was in that area, possible in close proximity to Wm. 's who also had property in Atascosa County, Texas County. These historical events that were transpiring at the time the Hesskew brother were living in San Antonio occurred in the spring and fall of 1842 respectively. The Mexican Army invaded Texas and captured San Antonio for a short period in each case. William and Moses both participated in routing the Mexican Armies from Texas. It is my belief that William Alexander Hesskew and Moses Hesskew are brothers, based on the simple fact that the Hesskews are cited as somewhat residing together or in close proximity in Gonzales County in the 1860 as well as other facts presented here including this letter written to William by Moses in 1879. We do know that after a while, both William and Moses decided to settle down and raise families. Both were issued marriage licenses within days of each other. Moses' marriage license was issued in Bexar County to Moses Hesskins and Levicy Higginbotham on 12/27/1844. Recent evidence suggest that Levicy's maiden name was Kelly. Tory Crook shared that Levicy was probably already married to Thomas Higginbotham when they came to Texas, before 3 Oct. 1839. Read more about Levicy here. Levicy was quite a women in her own right. She was an early pioneer women living on the outskirts of the western frontier town of San Antonio when Moses met her. Her husband who some say was killed in the "The Council House Fight " had passed away by 1842. The story of the The Council House Fight is quite a unique story and is worth reading. Recently a Hesskew Cousin, Ruth Claunch, produced an old letter that is written by Moses and directed to William although the name to whom the letter is addressed is vague. This too appears to validate our hypothesis that William and Moses are brothers. Cousin Ruth also shared that Moses was a School teacher. That might explain why there was a Hesskew School in the county at one time. Moses Hesskew was elected to the office of sheriff of Gonzales County between approximately August of 1848 to May 22 of 1849 at which time he resigned. I discovered this fact while visiting the City of Gonzales Chamber of Commerce. They are housed in the old County Jail and adjoin a small jail museum. Moses was listed among the the various County Sheriffs that have served with distinction. Why Moses resigned I do not know. There was a major Indian Raid in the County of Gonzales at the time Moses was in office. It seems highly probable that Moses would have defended the populace and his family during this time. The raid occurred in October shortly after Moses was elected Sheriff. Several settlers were killed in proximity to Gonzales, one being on the Sandies. Family members have passed down the following account. One afternoon, Moses' wife and daughter, Ann D. Heskew, were making pies and had left them on the window sill to cool. A number of Indian warriors approached the house but took only the pies...leaving the women alone. Another story had it that Moses Heskew was with a friend in his barn saddling their horses...Moses went back to the house, having forgotten something, and when he returned found his friend scalped...his horses gone! Mary Jane Hesskew, one of William's children married William Carroll Billings. One of the extended Billings family's daughters was married to John Wesley Hardin's cousin, Jim Clements thus establishing a link to the famous western outlaw. Hardin by some accounts was the most notorious outlaw of the Old West. Hardin lived in Gonzales at different times when he was not in the run from the law. John Wesley Hardin was reported to have killed over 30 men, including one for snoring according to an account I heard on TV. Hardin did not come to Gonzales as I understand it till the 1870s at which time he married a local girl. Wm. Hesskew has already moved to Refugio possible because of the lawlessness that existed in Gonzales and Dewitt counties during that period. The days of reconstruction following the Civil War were tough days for former resident. Corrupt politician and police who were backed by the U.S. army were disrespectful of southern women and former Confederate veterans. Hardin according to his own autobiography, put a few such men in there place while sending a few home early to the Lord as well. Although his actions seem outlandish by today's standards, the Southern consensus was much appreciative to see the local vagabonds punished, even if they did not agree with the methods. The period was also puncuated by the Taylor-Sutton Feud. Hardin frequently spent time in the area where William formerly had property and where his oldest daughter's husband's family, the Billings lived. Hardin was wanted for various deeds and the area settlers would provide support possible because they saw him as a positive influence in fighting carpetbaggers and other Yankee influnces that were suppressing the local populace. Hardin had sided with the Taylor side of the family which was more closely alligned with citizen from the Sandies area. The Sutton croud were predomidently from Dewitt County area, Cuero, which borders Gonzales County to the east. I've been told the Hesskew Family was aligned with the Taylor side of the fued but if so, it was not likely that William and Moses participated much in the affairs would be my guess. 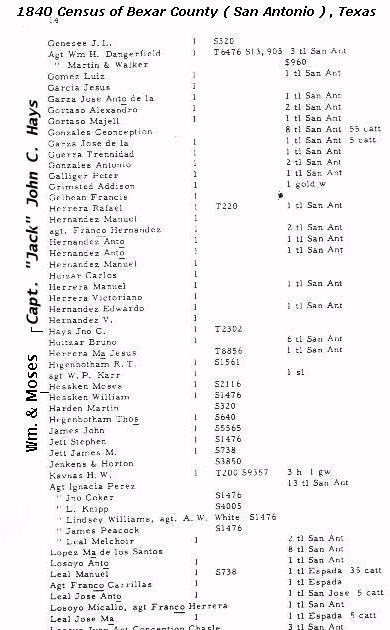 Moses was in his mid 60s by 1870 and William had moved to Refugio according to the 1870 census records. casand the Hesskew family may have been on the same side the infamous Taylor-Sutton Feud . An account by Harold Billings, a descendant of Mary Jane Hesskew, Wm. 's daughter, describes Hardin's interaction with the Billing's family. Wm. Hesskew had at one time lived in proximity to the Billings family which probably precipitated his daughter marriage to William Carroll Billings. I found records at the Gonzales County Archives that showed where Moses and his brother William were asked to layout and maintain a road near Gonzales. The archivist said that in those days different Men were appointed to keep the roads up, generally near there homes. ( probably at no pay too) Other duties included participating in the Militia and scouting the frontier fringes of the community for Indians. Later on it was recorded in County records that Moses refused to keep working on the roads, possible due to poor health. LDS records reflect that a Moses Heskew , from Gonzales, Texas ,is the father of Armitta Levicey " Eliza" Heskew b. Jan 8 1855, Gonzales. I contacted the individual who submitted the information through the LDS with out any conclusive results. Moses according to a tribute to him on his death in the Gonzales paper was from the Marberry District of South Carolina. There was a Hesskew Springs and a Hesskew school located on (present) John Billings property, around 1900. The Hesskew family was one of the very early families in this area, listed on the 1860 census at the Salt Stream Post Office. The road from Pilgrim to Smiley use to go by Hesskew Springs, before the present Hwy. 87 was built . There is still a windmill at the site of the old Hesskew home & school. The above information conflicts with the facts that a Marriage License. was issued in Bexar County to Moses Hesskins and Levicy Higinbotham 12/27/1844. Ann 1852; Armetta L. 1855; Gilpen M. 1859. Listed with them in 1870 was Maggie E. KELLY b.1869 TX and Leonard E. Kelly b. 1836 TN. relationship (if any) not shown. Note: An Amanda Hesskew b. ca 1850 md. Wm. 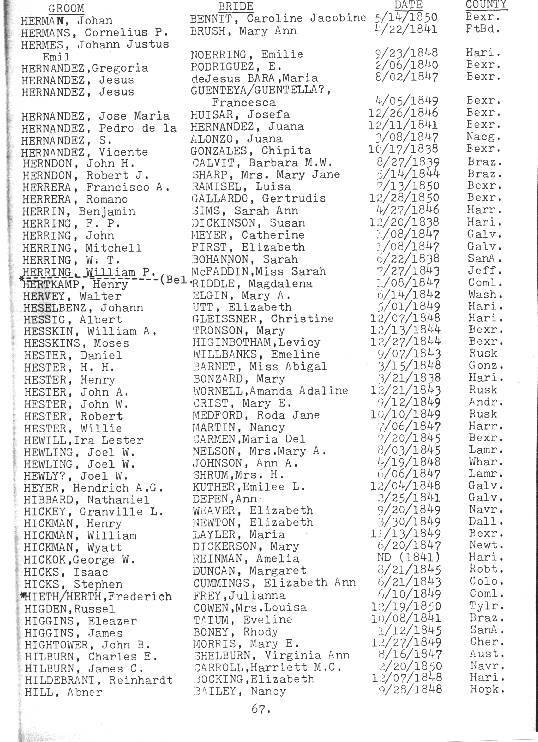 H. WHIDDON; her death record states that her mother was Missouri SHAW HESSKEW & her father's name is not listed, This writer wants to know how/or if, Amanda was related to the Hesskews Listed in this book. Kathleen Springs Transcriptions This file contains 3 Jan 1880-6 Dec 1884 Note that Real Estate Transfers, Court Proceedings, Jury Lists, and some other lists normally kept in the courthouse were not included in the original indexing, however they are on the microfilm.